This rich and proud history is honored through special entertainment with a message. 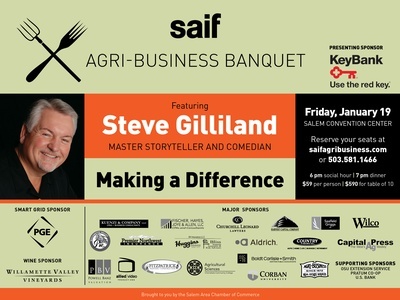 The banquet features a special guest speaker’s humor, inspiration, and business insight along with an appreciation for agricultural values. Each year we also recognize an outstanding Future Farmers of America student for leadership in shaping the future of the industry. This fun night honors a special part of Oregon’s history and culture, while looking forward to its future. Visit the event webpage for more information.